THIS GITE IS RENOVATED FULLY IN NINE IN 2004, IS AT THE LEVEL OF DECORATION A MIXTURE OF WOOD AND RAW COATING. THE DOMINANT COLOR IS THE BORDEAUX THAT WE FIND ON THE CANALS, THE PLAIDS, AND THE TOP OF THE BEDS. THE DECORATION IS IN HARMONY WITH THIS OLD FARM. YOU WILL FIND THE SAME LEVEL A BATHROOM WITH BATHTUB AND DRY TOWEL (also washing machine and dryer). BUT ALSO A TOILET AND A ROOM WITH A BED OF 140. -1 A bed of 140 and a bed of 90 plus a corner toilet. -2 Three beds of 90. -3 A 140 + 1 baby bed. Baren small mountain hamlet at 900 m altitude with stunning views of the Pyrenees, between St Béat and Luchon, this old farmhouse renovated with all modern comforts can accommodate from 5 to 9 people depending on the gite . Little traffic in the village. Private parking at 50 m.
A game room with foosball pro and table tennis is available as well as a petanque court. On the floor 1 room (1 bed of 140 + 1 bed of 90 + corner toilet), 1 room 3 beds of 90, 1 room 1 bed of 140, room of water + TOILET. Terrace of 30 m2 on closed ground with living room of garden and plancha gas and deckchairs. On the floor 1 room (1 bed of 140 + 1 bed of 90 + corner toilet), 1 room 2 beds of 90, 1 room 1 bed of 140, room of water + TOILET. TOURIST ATTRACTIONS: Rafting, Canyoning, Varape, mountain biking, walking paragliding, golf, tennis, swimming pool, as much leisure on the spot or to 8 kms maximum. A CORNER IS DONE IN THE BATHROOM OF THE DRC FOR THE WASHING MACHINE AND DRIED LAUNDRY. THE BATHROOM LOWER IS EQUIPPED WITH A VASQUE AND A BATH. SEPARATE WC. THE UPPER BATHROOM IS EQUIPPED WITH A SHOWER, VASQUE AND TOILET IN THE SAME ROOM. SWIMMING POOL HEATED AT 27 ° IN SUMMER. COMMON SWIMMING POOL WITH 2 OTHER GITES OF 5 AND 6 PEOPLE GAMES ROOM WITH BABY FOOT PRO AND TABLE PING PONG PETANQUE 10 TRANSATS AVAILABLE IN A COMMON GARDEN ABOVE THE SWIMMING POOL. GAS PLANCHA. COMMON ROOM FOR DEPOSITING BICYCLES, SKIS ... WOOD STOVE FOR WINTER. A WOODBOX BY GITE ALLOWS YOU TO CONSUMER WHAT YOU NEED WITH PAYMENT OF WOOD AT THE END OF YOUR STAY. Du charme et du calme, avec tout le confort nécessaire. Une semaine en famille dans un super cadre, pour le repos de tous. Merci bien pour ce retour. J'en fais part à Mme Arnou qui fait l'accueil de nos Gites sur place. 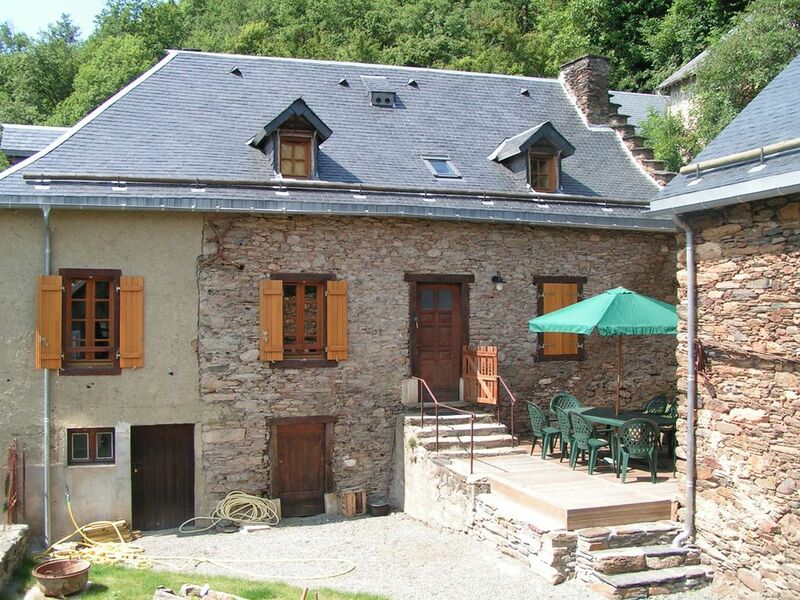 3 EPIS GITES NEAR LUCHON. SKI RESORTS NEAREST SUPERBAGNERES PEYRAGUDES BAQUEIRA BERET AND THE BOUTX MOURTIS. POTHOLING RAFTING HUNTING FISHING CLIMBING A LUCHON. LUCHON IS RECOGNIZED AND SPA IN THE SPECIALIZED ENT. OUR COTTAGES ARE LOCATED A SMALL JOINT BAREN 8 KMS DE LUCHON AND 20 KMS OF SPAIN. WINTER SKI AND SUMMER RIDE. OUR COTTAGES ARE LABELLED GITE DE FRANCE 3 EPIS. 3 GITES HAVE OUR COMMON HEATED POOL SUMMER, AND FACE SUPERBAGNERES LUCHON. FESTIVAL OF FLOWERS LUCHON THE 3RD OF AUGUST Sunday. RESTAURANTS NEAR A LUCHON AND VERY GOOD FOR ESPAGENE PAELLA. BAREN IS 900 METRES ALTITUDE MOUNTAIN. THE CITY IS CLOSEST LUCHON 10 MNS IN CARS. WINTER SKI, FLUSH THE FALL WALKING MOUNTAIN SUMMER POOL ON SITE, Rafting, canyoning, mountain biking. BUSINESSES NEAR BAREN IS A BAGNERES DE LUCHON. THERE IS ALSO A CASINO LUCHON. A GLIDER SUPERBAGNERES. GOLF LUCHON. Skiing: SKIRUN SUPERBAGNERES PEYRAGUDES AND A 24 KMS. SHUTTLE DEPARTURE POSSIBLE FROM PEYRAGUDES LUCHON. DEPARTURE TELECABINE SUPERBAGNERES POSSIBLE FROM LUCHON. MUST RELY MNS ABOUT 25 TO GET IN A CAR BAREN SUPERBAGNERES LUCHON THROUGH TIME AND IDENTICAL TO GO TO A BAREN THROUGH PEYRAGUDES LUCHON. BAQUEIRA BERET ONE OF THE BIG STATIONS SPANISH IS 1 HOUR ROAD BY CAR. ACOMPTE DE 25% A LA RESERVATION, LE SOLDE 30 JOURS AVANT LE DEPART. CAUTION DE 350€ à l'arrivée. FORFAIT MENAGE 90€. CONTRAT GITE DE FRANCE COMPRENANT 8KW ELECTRICITE PAR JOUR, LE COMPLEMENT A LA CHARGE DU LOCATAIRE.